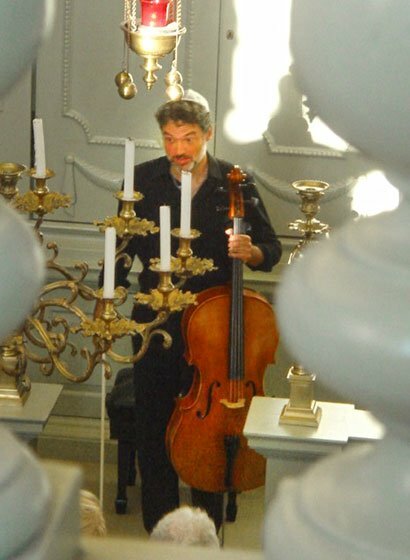 For its first concert in the Newport Music Festival, The Touro Synagogue welcomed Jiří Bárta Sunday for a solo cello recital of music by J. S. Bach and Zoltan Kodály. Sweltering conditions matched the heated performance. Performing any of J. S. Bach’s Suites for Violoncello Solo is an act of great courage for any cellist. Everything one is as a musician is exposed, from technique to musicality. Each phrase is rife with interpretative decisions, and opinions about how to play Bach’s music are as numerous as the musicians and the audience. (The same is true for his Sonatas and Partitas for Violin.) These opinions tend to be strongly held and hotly debated (not unlike questions over the “proper” performance of Bach’s Mass in B Minor). Eric Siblin surveyed some of this terrain in his 2009 book, “The Cello Suites: J. S. Bach, Pablo Casals, and the Search for a Baroque Masterpiece.” After almost two centuries of neglect had reduced them to mere technical études which were only rarely performed one movement at a time as encore pieces, Casals returned the suites to the stage. We are blessed to have a recording of Casals performing them; admittedly the sound quality reminds us these recordings were made in the 1930s and, according to some, Casals was past his prime when these recordings were made. Still, what we can hear is an intense engagement with the music, Casals’ somewhat-idiosyncratic theories of pitch playing out in the performances, and a reading of this music that reflects late-nineteenth and early-twentieth-century performance practices. Now the pendulum has shifted away from this romanticized reading of Bach towards historically informed practices so familiar to Boston audiences. If we imagine a spectrum of possible readings of the Bach suites, Casals represents one end while the other is held down by Anner Bijlsma. Bijlsma, in his book Bach, the Fencing Master, argues that everything we need to know to perform this music is in the manuscript—each articulation, every mark on the page has meaning. (To his credit, Casals insisted each of his students learn their own way through this music and find multiple interpretations for each phrase, movement, suite, rather than a rote copying of his own decisions.) Every cellist learns the suites; many have recorded them, some more than once. Continual study, repeated performance, constant engagement yields new insights into the music. To his credit, Bárta has spent time with this music. His 2000 Supraphon recording of the Suites represents one take on this music; what he played today shows new insights into this music. Bárta does not hew to any “party line” in playing Bach, and this might offend some ideological purists. I found the combination of historically informed performance practices with some of the musical and phrasing ideas Casals promulgated to be an interesting and very moving middle ground, a personal take on this music reminiscent of the idiosyncratic readings of virtuosi of yore. This was Bárta’s Bach. Throughout the recital, his technical command of cello and bow were manifest, aiding and abetting his musical ideas. I was struck by his agile, dexterous bowing, coupled with a remarkably supple bow hold (seemingly as loose as that of Steven Isserlis); this made so very many sounds possible. The concert included Suite No. 4 in E-flat Major, BWV 1010 and Suite No. 5 in C Minor, BWV 1011. Throughout each Bárta displayed a variety of colors and tones and used a wide dynamic range. There was a lot of legato bowing (more so than Bijlsma would advocate, less than Casals played). Vibrato was used with judicious restraint. The tempi were slower than many other performers, and with a good deal of rubato; the effect was one of expansive deliberation—neither rushed nor wallowing. The movements of each suite maintained a dancing character, with stylized phrasing and rhythmic integrity to keep the momentum flowing, even as the music paused and breathed at key moments. The tightly-controlled dynamic range, including true piano, pianissimo, and even a pianississimo at times, gave this reading of these suites a great sense of intimacy, of interiority. Repetitions (within movements, and the second time through Bourrée I and Gavotte I) were quieter, softer: repetitions became faint echoes, memories of music heard earlier. The tonal variation in the Prelude to the fifth suite was a revelation: Bárta used sul ponticello sound to pick out one of the voices in the fugue, making the structure much clearer and more obvious, and offering a neat solution to the great dilemma of playing a fugue on what is essentially a melodic instrument. Although the concert was billed as being without intermission, the heat and lack of air conditioning led Jiří Bárta to propose a brief, and very welcome, short break. He returned to perform Zoltán Kodály, Sonata in B Minor for Solo Cello, op. 8 (1915). A fiendishly difficult work, it combines influences of Debussy with Hungarian folk tunes, demands scordatura tuning and agility across the full compass of the fingerboard. The recording of reference is one released in 1970 by the late János Starker, who performed the work for Kodály shortly before the composer’s death and received his blessing. Bárta more than met the challenges of this sonata, all the while maintaining a keen sense of musical line. The folk tunes shone through, and the recurring theme was prominent without being overpowering—obvious enough to make the sonata structure audible and connect the three movements of this work to one another. A playful spirit suffused Bárta’s reading of this music, which is a nice addition to Starker’s more considered interpretation. Celebrating the 250th anniversary of its dedication, Touro Synagogue is a singular jewel-box space with great acoustics. The windows were open, and fans whirling, so there was more ambient noise than most concert-halls. The obstructed views from the balcony were less than ideal. Despite all the challenges posed by the atypical venue (used here for the first time as part of The Newport Music Festival) and the blazing sun’s heat, this was a fabulous concert enjoyed by a capacity crowd. Many of us stood for better views; almost every one of us hung on each note. According to the festival’s book, this is Bárta’s 16th season in Newport; I hope I have many more opportunities, perhaps some even in Boston, to hear him perform again.